Sword and High Quality Stand with Wood Base Included. This Beautiful Display suit of armor is hand-made in Spain. 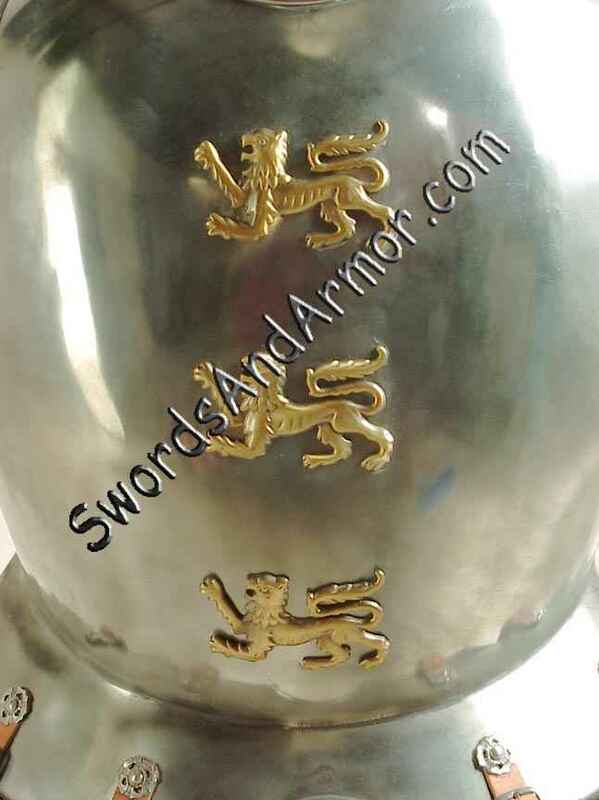 I features a very nice armor breastplate adorned with 3 brass rampant lions. It is the classic style typical of the Mid-16th Century period with a definite Spanish influence. The armor comes just as you see it with the stand, inner support frame and the very nice display sword. There is also a very nice blue skirt at the torso area and also has ostrich feather plumage on the helmet. The helmet has a movable visor. The fully assembled unit on the stand as shown stands approximately 6'2" Tall to top of helmet. The item requires minor assembly. This item is not wearable and is for display purposes only. The 3 Lions Upgrade as Shown!